Scent has developed a ‘toolbox’ of new applications and systems to engage citizens in environmental monitoring and to enable citizens to become the ‘eyes’ of the policy makers. 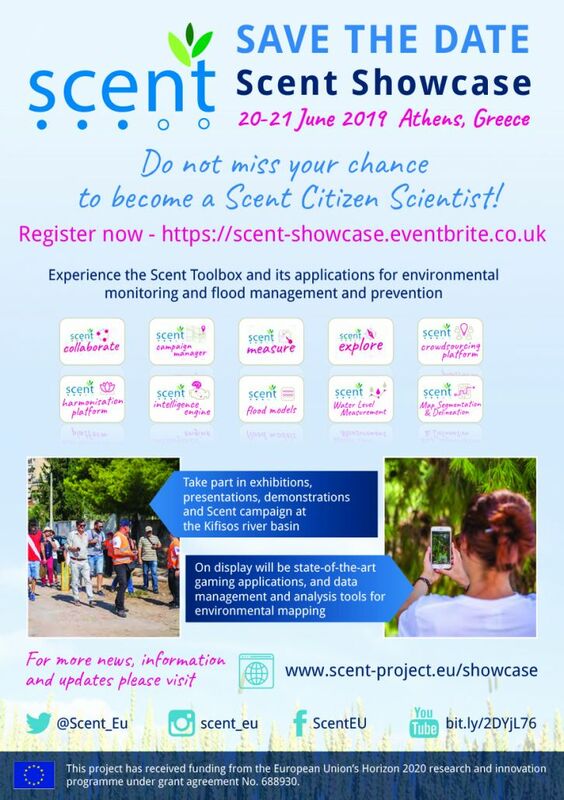 Don’t miss your chance to become a Scent citizen scientist and to experience these new applications at the Scent Showcase. On the first day of the Showcase, participants will take part in exhibitions, presentations of the Scent Toolbox. On display will be data management and analysis tools for environmental mapping including state-of-the-art serious gaming apps, Scent Explore and Scent Measure. A dedicated Scent pilot campaign at the Kifisos river basin will take place on the second day of the campaign. Participants will be guided along the banks of the river, where they will be able to test the Scent apps in reality. The project will demonstrate the huge potential of citizen observation and monitoring of the environment. To take part in the Scent Showcase and to join the Scent movement click here. You can learn more and keep up to date with all the information about the Scent Showcase by visiting our dedicated webpage: scent-project.eu/showcase.